Cagney 1-Handle Pull-Down Kitchen Faucet in Stainless Steel with Soap Dispenser Cagney delivers an impressive range of functionality in one faucet - high arc spout for maximum reach; single-handle temperature and flow control; 3-function spray head with stream, spray, and pause activation buttons right in the palm of the hand. If you're looking for a faucet that has it all and offers lasting value, Cagney is the perfect choice. 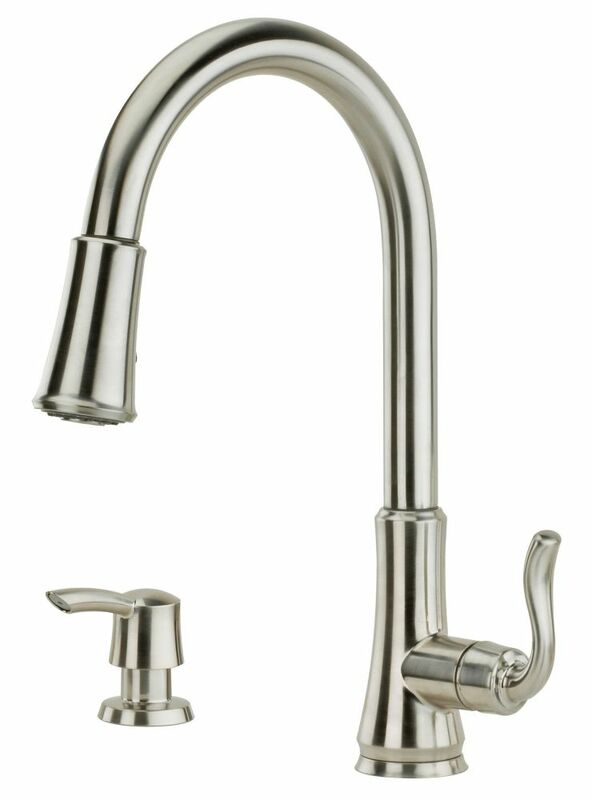 Cagney 1-Handle Pull-Down Kitchen Faucet in Stainless Steel with Soap Dispenser is rated 4.0 out of 5 by 45. Rated 1 out of 5 by Rita from Never worked properly I have this faucet for year and a half and this is a constant pain. Spray head never functioned properly and now all the faucet has broke. Water doesn’t flow through normally,only about 10%of the flow. I’ve opened a case on the Pfister website but didn’t get a response. So now I just have no water in the kitchen,no possibility to cook. And I did change the cartridge which didn’t solve the problem. Don’t buy! Rated 1 out of 5 by Fed up from Spray Head This is the second faucet i have installed,spray head failed both times,got replacements at least 4 times. Finally changed model,will see how that goes ?? Rated 2 out of 5 by Wantaworkingfaucet from Looks great but functionality is sub-pay I have this faucet in matte black. Installed in 2015 and shortly thereafter had issues with the faucet head not docking properly. We weighted the hose and that helped a little. Over the years we've had persistent issues with the spray buttons not functioning properly. Today, after less than 2 years of use, the spray stopped working completely. Will uninstall, take apart and try to repair but I wouldnt purchase this product again - especially for the price point. I'd expect it to function significantly better and last much longer. Rated 5 out of 5 by Anonymous from Great buy I've had this faucet for about a month now and it has exceeded our expectations.